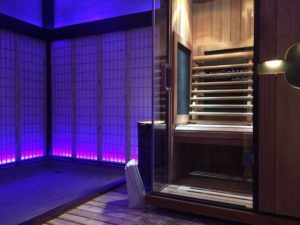 Our sauna is a full spectrum infrared sauna, meaning that it emits not just far infrared heat, but also near and mid infrared. 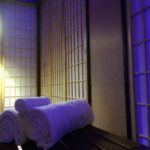 How Does Infrared Sauna Therapy Work? An infrared sauna works differently from a traditional steam or dry sauna. A traditional sauna heats the environment around you, and you get hot in response to that environment. For a lot of people, the low oxygen level in an extremely hot and steamy environment can result in side effects such as nausea and dizziness and a reduced amount of time that can be tolerated. 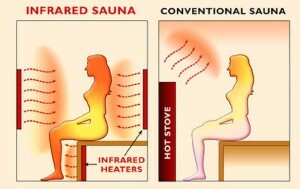 An infrared sauna, however, works by heating liquid within any object inside the sauna. That means you, comprised of somewhere between 60-70% water. The result is a much more comfortable environment that you can tolerate for much longer than a traditional sauna, producing the same, if not better, sweat response. Infrared is the ‘warm’ energy in humans, animals and plants; the invisible part of the sun’s energy. It exists just outside the visible light spectrum, on the opposite end of that spectrum from ultraviolet light. The intensity of Infrared produced by the human body constantly fluctuates. When its intensity is high, we feel healthy and are able to overcome ailments. When the Infrared begins to decline, we are subject to disease and illness and tend to age more quickly. We can be exposed to Infrared heat for hours and it will never cause our skin to burn. Infrared heat is completely healthy and safe for all living things. Our bodies radiate far infrared energy through the skin at 3 to 50 microns, with most output at 9.4 microns. Our palms emit FIR energy also, between 8 and 14 microns. ‘Palm Healing’, an ancient tradition in China, has used the healing properties of far infrared rays for 3,000 years. These natural healers emit energy and heat radiating from their hands to heal, much the same as Reiki healers do. Current research conducted in Taiwan has measured significant far infrared energy emitted from the hands of Chi Gong masters. We all know that the winter months can be pretty bleak in the Pacific Northwest. It’s one of the world’s epicenters for Seasonal Affective Disorder, or SAD, affecting approximately 30% of Pacific Northwesterners. Often striking in October to November, when our sun exposure declines and our vitamin D levels drop, SAD is a major contributor towards debilitating depression throughout the winter. 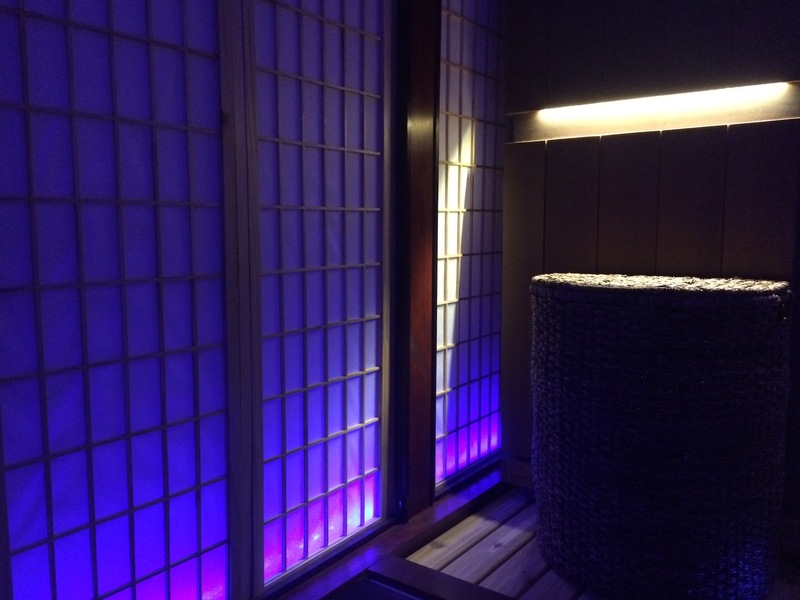 Fortunately, in addition to our infrared sauna, our Fire & Water Room is also equipped with a 17,000 Kelvin color temperature light lamp that emits a full spectrum light, simulating the effect of exposure to summer sunlight. The benefits of full spectrum “lightboxes” on seasonal affective disorder have been clinically proven over multiple decades of research. The Center for Environmental Therapeutics is a good resource for learning more about the scientific evidence supporting the therapeutic benefits of SAD lights. In addition to directly absorbing 17,000 Kelvin of winter blues-busting light, our lightbox also has a negative ionizer, releasing 4.5 x 10^14 Ions per second. This release of thousands of charged particles of energy is similar to what experienced when near nature’s most beautiful environments, such as rainforests and waterfalls. 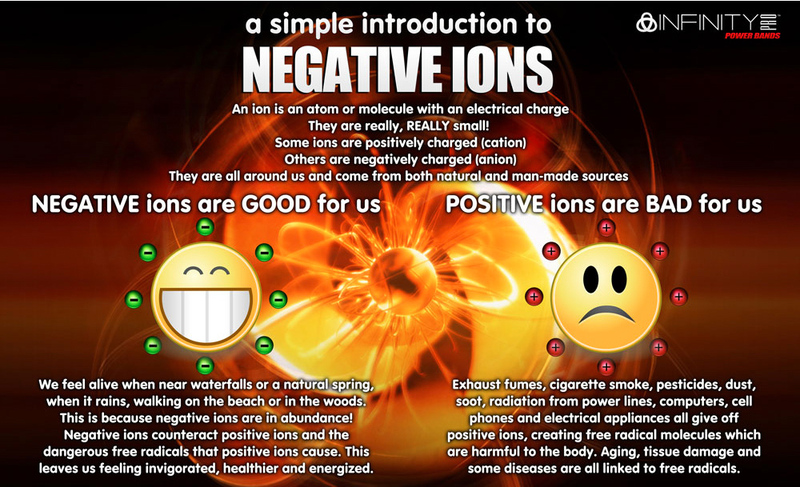 Combined with our resident Himalayan salt lamps that also release Ions into the air, a session in the infrared sauna with our full spectrum light helps off-set the damaging effects of electromagnetic frequencies that are all around us. 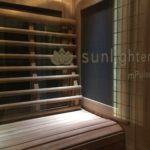 These combined features of infrared sauna sessions not only help those with seasonal affective disorder, but those yearning for a holistic approach to decreasing low mood and energy with a chemical-free solution. 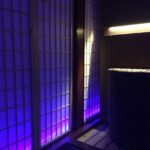 All Full Spectrum Infrared Sauna sessions are held in our Dojo room, and are 45 minutes long, giving you a full 30 minutes of private sauna time plus 15 minutes for a shower. Or you can take a 44 minute sauna and have no shower. You’re choice! If you’d like longer than this, just give us a call at 360-972-3031 and we’d be happy to book you two sessions back to back. If you’d like, you can bring a guest with you for an additional $10. Our sauna comfortably seats two average-sized people. 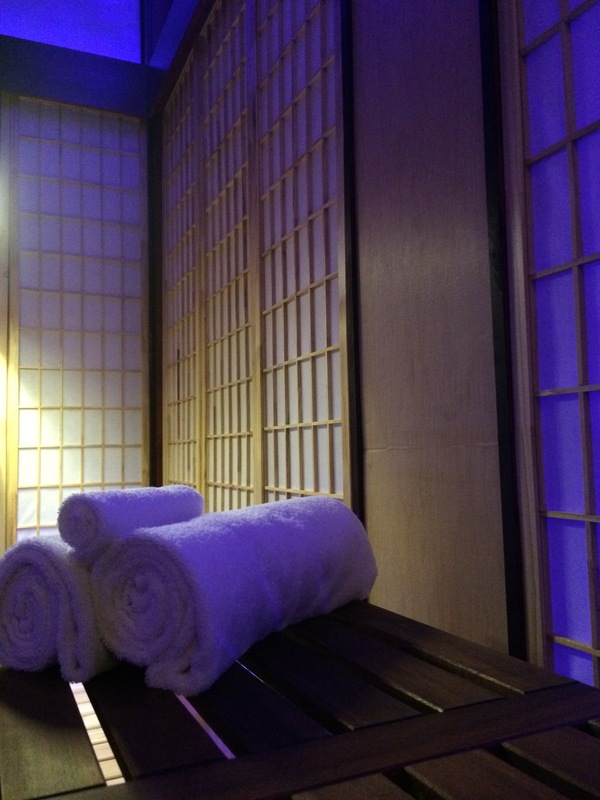 Float Club Members: You get a free infrared sauna session each month with your membership. Just book yourself a regular 45 minute sauna session, and it will be paid for from your membership benefits. Sauna Club Members: Similarly, book yourself a regular 45 minute sauna session, and it will be paid for from your Sauna Club membership benefits. 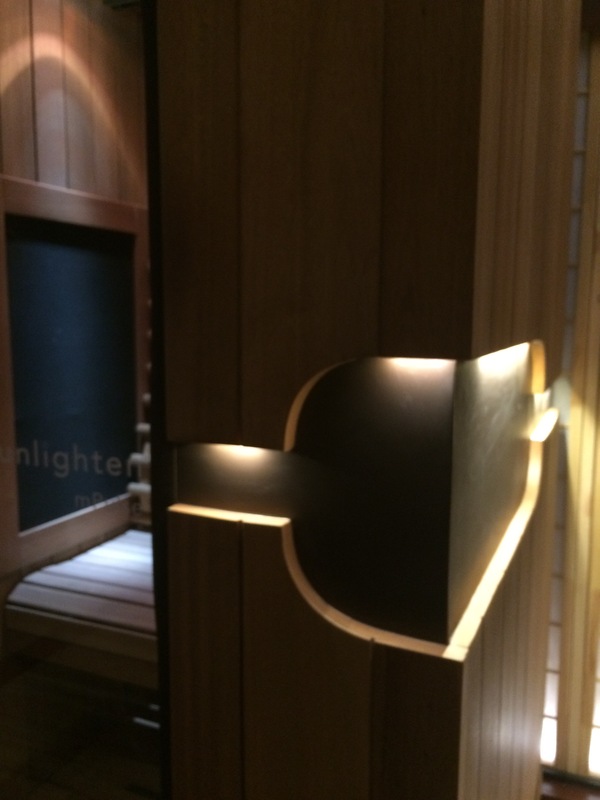 Infrared sauna sessions start at 120 degrees, and can go up to 140 degrees from there. If this is your first infrared sauna session, we recommend starting at 120°F and then adjusting from there based on your experience. We do not recommend sauna sessions any longer than 60 minutes, and if you are working on a specific form of detoxification, such as heavy metals, biofilm or a pathogen, you should consult your doctor first and limit your sessions to 15-20 minutes. See the FAQs section below for more details. Member Session Length: All member sessions allow 45 minutes in the Dojo, giving you enough time for a minimum 30 minutes in the sauna, plus shower. You can schedule two back-to-back if you’d like a full 60 min session. Share Your Sessions: You can share your Sauna Club Membership sessions with friends and family, or give them away as gifts. We’d be happy to provide you with a nice gift certificate, “written” off of your Sauna Club membership. Sweat With Your Sweet For Free: With a Sauna Club membership, your significant other or friend can join your sauna session for no extra cost. As a benefit of membership to Oly Float’s Float Club, all members receive a free monthly 30 minute Infrared Sauna session. 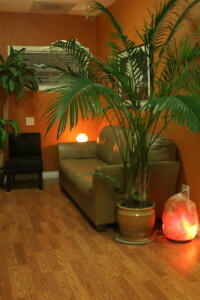 Following up your float session with an infrared session is doubling-down on your health benefits at The Soul Space. 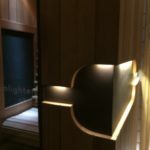 With your body and mind in a fully relaxed post-float state already – with your parasympathetic nervous system unwound and ready for healing – the benefits of 30 minutes in the infrared sauna are compounded. If you’re already a Float Club member, in addition to your monthly free sauna session, you can buy any other sauna price option – whether it’s a package or an IR Club membership – for 15% off the regular price. Q:Under which conditions should I NOT use an infrared sauna? If you any medical concerns about using sauna, always consult your doctor – particularly, a doctor experienced with sauna therapy – before using one. Dr. Evan Hirsch at the Hirsch Center for Integrative Medicine is an excellent resource. As with floating, just you! We provide all the towels and shower soap you need, as well as a fresh supply of filtered water. In order to minimize clean-up, we’ll ask you to wear one of our spa robes while in the sauna. If you’d prefer, you can wear a tank top and sit on a towel. Basically, we try to minimize direct sweat contact on the seat. Q:How hot does the sauna get? The recommended temperature range for infrared sauna sessions is 120-150 degrees. Infrared heat is a different type of heat than traditional wet or dry saunas, so while you do sweat you don’t feel as hot as you might in a traditional sauna. If you have concerns about getting too hot, start out at the low end – 120 degrees – and adjust upwards from there based on your comfort level. You have full control over the temperature while you’re in the sauna. Q:Is it safe to use if I have heavy toxification? Dr. Evan Hirsch at The Hirsch Center for Integrative Medicine is an outstanding physician who is well educated in the therapeutic use of infrared sauna for detoxification. We recommend working with him if you are dealing with a chronic toxicity burden, and formulating a plan for how often, and for how long, you should use our infrared sauna. Q:Do I need to consult a doctor prior to using the sauna? No. But if you’re working on a chronic health issue and even have this question in your mind, we recommend you do work with a qualified doctor to integrate far infrared sauna therapy into your treatment program wisely. Dr. Evan Hirsch at The Hirsch Center for Integrative Medicine is an outstanding physician who is well educated in the therapeutic use of far infrared sauna for detoxification. We recommend working with him if you are dealing with a chronic toxicity burden, and formulating a plan for how often, and for how long, you should use our far infrared sauna. Q:What’s the lowest-cost way I can use your IR sauna? 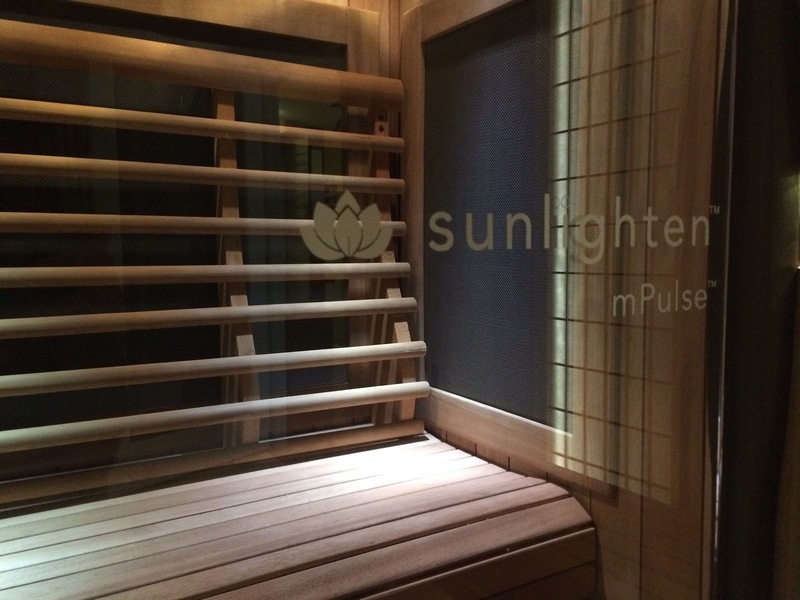 See the Pricing tab for details on getting infrared sauna sessions at up to 50% off the regular cash rate. We want the sauna to be as accessible as possible, especially for those working on chronic health issues (we know how those medical bills can add up! ), and offer a variety of ways of reducing the per-session cost. Q:What type of S.A.D. light therapy do you use? We use a Naturebright lamp, which emits 17,000 Kelvin of blue light. You can find out more at naturebright.com. Q:Does the S.A.D. light therapy boost vitamin D? “By harnessing the healing powers of the blue sky — Nature Bright’s gold standard — Sky Effect™ technology produces a prescription strength light — an optimized amount of blue light rated at 17,000 degrees Kelvin. It’s cool, safe, and comfortable. When you think about how many medical experts are recommending light therapy, it’s hard to argue: This technology is just what the doctor ordered! Okay, so studies have proven that our highly refined, clinically tested branch of light therapy works … but how does it work? The basic idea is that the eye’s retinal receptor senses blue light and sends signals to the hypothalamus, that area of the brain where sleep and emotive functions are regulated. Extra blue light signals can help us get back on track if we’re restless, nervous, or have just travelled across time zones. As you can imagine, daytime melatonin can present challenges, such as depressive disorders, irritability, moodiness, disorientation or energy drains. You certainly don’t want to hibernate your day away! Almost everyone with a mood disorder suffers worse in the winter because of excess melatonin in his or her system. 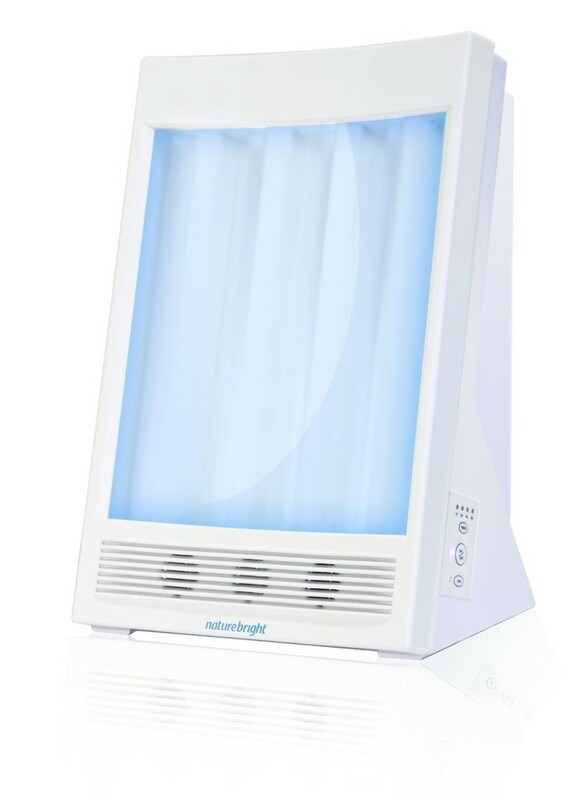 NatureBright’s bright light therapy™, which is light therapy that leverages their Sky Effect™ technology, does a spectacular job of suppressing melatonin – on schedule, even on dark days or when the body’s clock seems to have a mind of its own. This fact has led many clinicians to use light to treat depression successfully. It often outperforms standard antidepressants. Q:What do I do while I’m in there? Use your phone; if you must. We highly recommend just taking a break from devices for 30 minutes, keeping them on Airplane Mode while you relax. But … we have successfully tested iPhones in there without any apparent overheating issue in a typical 30-45 minute session, though phones have overheated at longer exposure times than that. Take in electronics at your own risk. Q:Should I smoke a bowl or get some drinks in first to, you know, relax? In a word: no! Any state of mind alteration – whether it’s from drugs, alcohol or plants – is a danger when combined with high heat. Never consume alcohol, marijuana, or recreational drugs prior to using a sauna. Q:Can children use the infrared sauna? This article has some good information on kids and saunas.